My parents, sister and brother live about twenty-seven miles away from us, the kids and I visit them about once a week. Today, CC and RJ had an exciting play date with their 6 year old cousin. 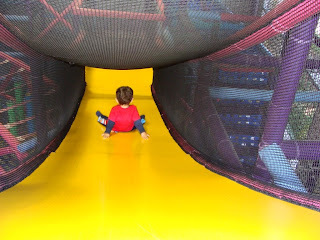 We all had some fun at AdventurePlex, a children’s fitness center with an open play area that has an enormous indoor play structure. We last visited this facility about five months ago and on that occasion CC and RJ spent most of their time in the toddler area. 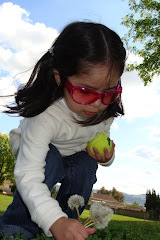 This time they explored every inch of the structure and had a great time climbing, crawling, jumping, swinging and sliding. 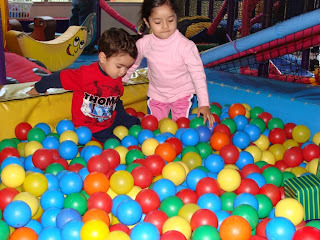 This was the first time CC and RJ both entered a ball pit without being afraid. We then made it out of the toddler area and into the play structure. 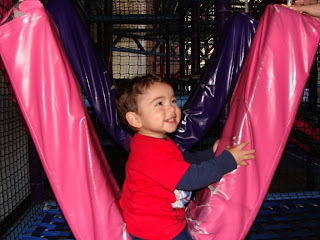 Here is RJ sliding and bouncing. CC's favorite spot was this rope swing. RJ initially spent his time following CC around (like he usually does at home), but then he started to explore on his own and this is where he ended up. 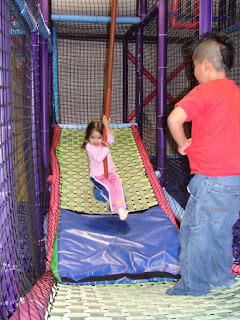 On this picture, you can see CC in the background and can get an idea of the size of the play structure. We all had a great time at AdventurePlex, especially since we had the whole place to ourselves during most of our visit. 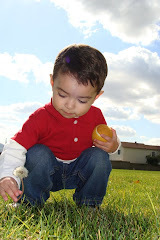 I only wish it was closer to our home so that I could take the kids there more often.